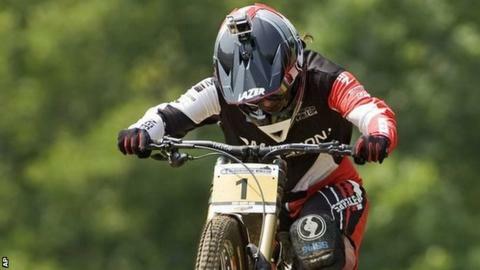 Wales' Manon Carpenter was pipped by rival Rachel Atherton at the British Mountain Bike Downhill Championships. Atherton won in two hours 17.141 seconds in Llangollen, with Carpenter finishing in 2:22:573 and Katy Curd taking bronze in 2:24:627. Danny Hart took the men's title, ahead of Sam Dale and Ruaridh Cunningham. Carpenter's Welsh compatriot Dylan Kerfoot-Robson took Under-23 silver in the British Cross-Country Championships at Hadleigh Park. Iain Paton took gold in the age-group race, with Mike Thompson in third.